What a thankful weekend we’ve had. My Mom, sister (and co-host of this blog) Mal and her 4 kids came to visit. Many laughs, cries (from the littles) and treats were shared. I hosted a L’Bri party that my lovely friend Kara is the consultant for, and I needed to make a snack for the gathering. 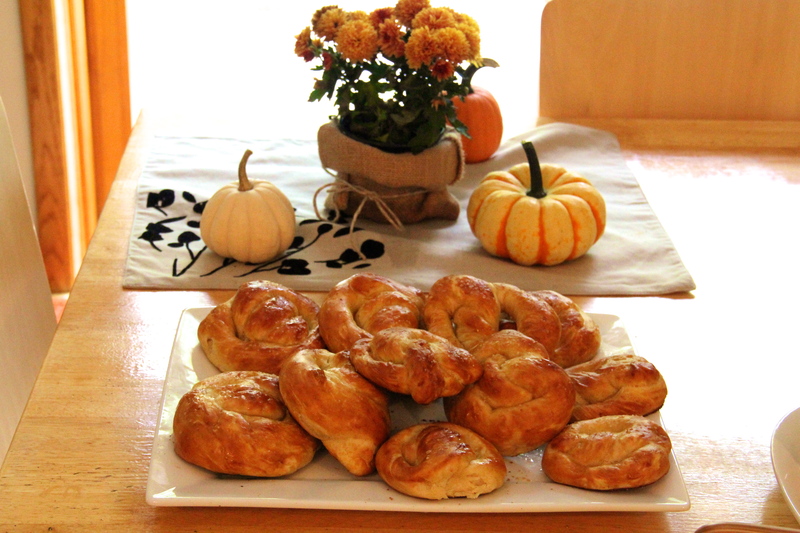 I had made homemade pretzels last week and paired it up with tomato soup- it replaced the grilled cheese I normally make with tomato soup. It was a big hit for both occasions. I don’t know why pretzels seemed to be a thing of complication and a treat you only get elsewhere. Now that myth is broken on both accounts. 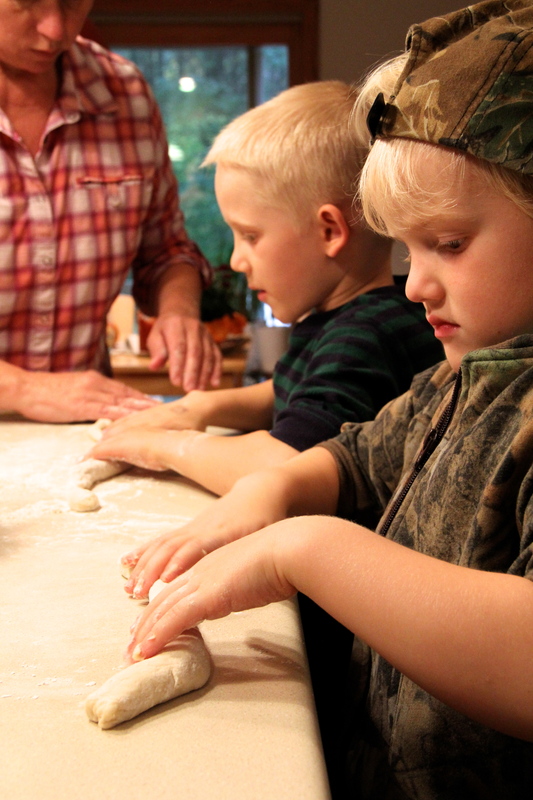 Not only does it take few ingredients, but it’s so easy that kiddos can make them too. All three of my older niece and nephews pitched in for this round of pretzels and everyone enjoyed the aftermath (devouring these beauties with cheese sauce). 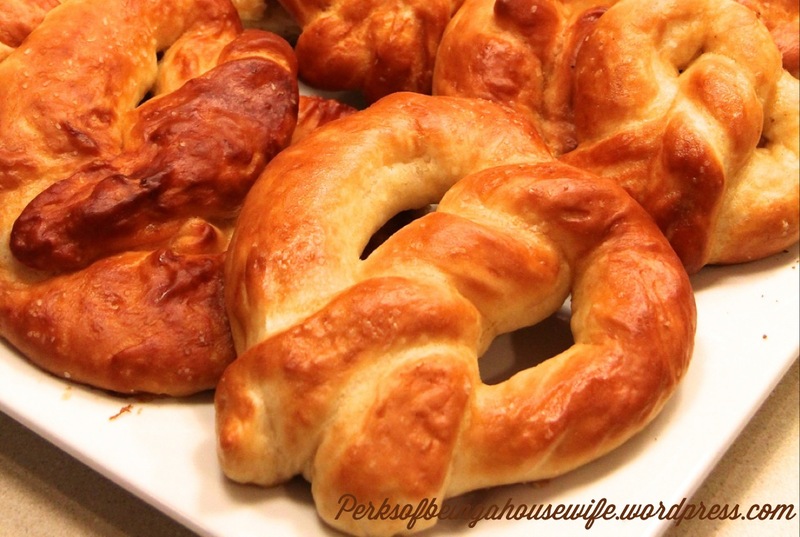 Check out our fun time preparing to make these delicious homemade pretzels with cheese sauce. First take the milk and microwave it until warm-roughly 1.5 minutes. Yeast will be added next, so you don’t want it so hot that it kills the yeast (You should be able to comfortably put your finger in it). Add the yeast and let it sit for 3 minutes. 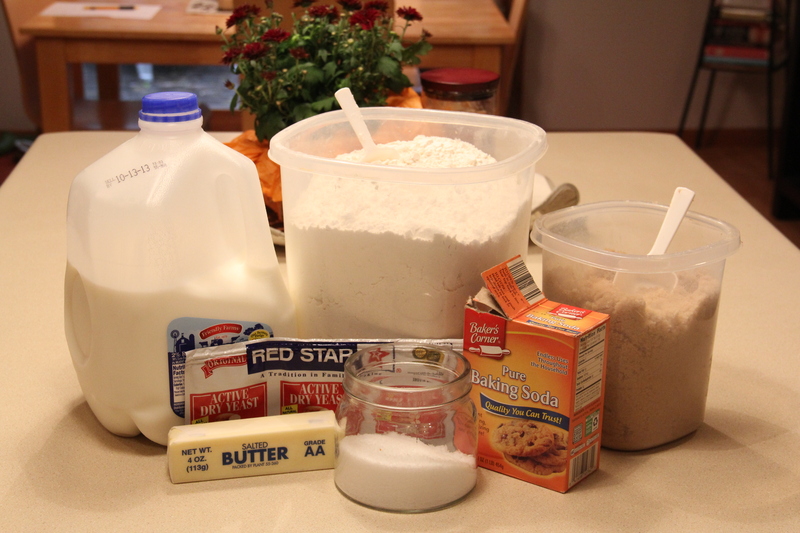 Add the milk/yeast mixture, butter and sugar to a large bowl or your mixer bowl. Next you will add the flour 1 cup at a time until all mixed in. Lastly add your salt. 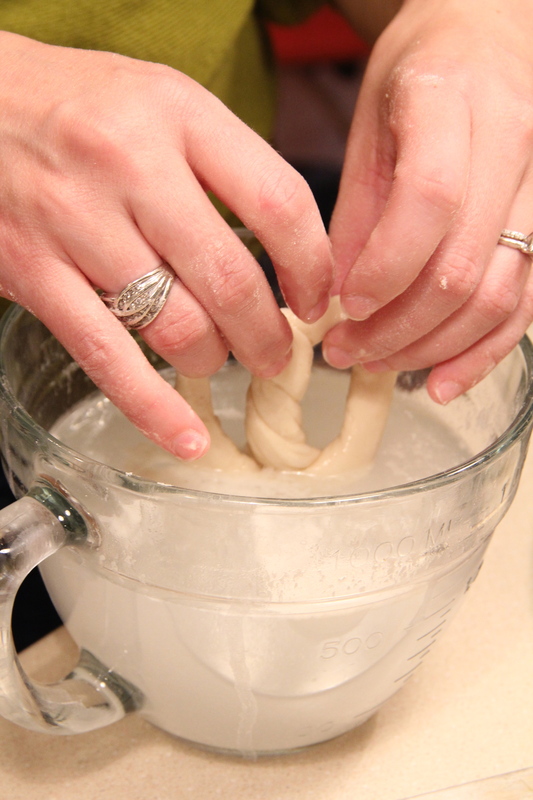 Kneed the dough in your mixer with a bread hook or by hand for 10 minutes. Place dough in a greased bowl and cover with a greased piece of saran wrap. Allow dough to rise in a warm place for 1 hour until doubled in size. Preheat the oven for 450 degrees. (I know it’s really hot but your house will be toasty warm then). Take the 1/3 cup of baking soda and combine in a bowl with 3 cups warm water. Set aside. 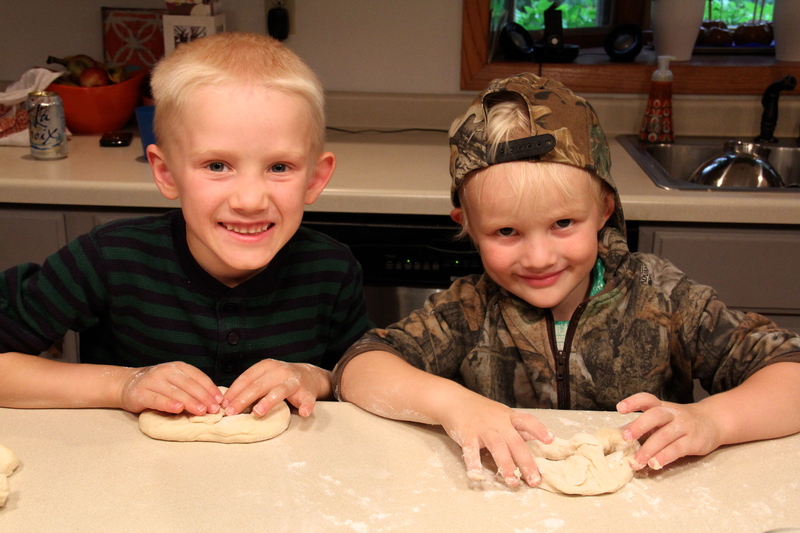 Take your risen dough, punch it down and split dough in half. Take one half and split it into 3 sections, and then from there- split those 3 sections in half. Repeat with the other original half of dough. You should be able to make 12 pretzels by dividing the dough this way. You can opt to split them further if you prefer smaller pretzels. Next, you roll out the dough sections nice and thin. 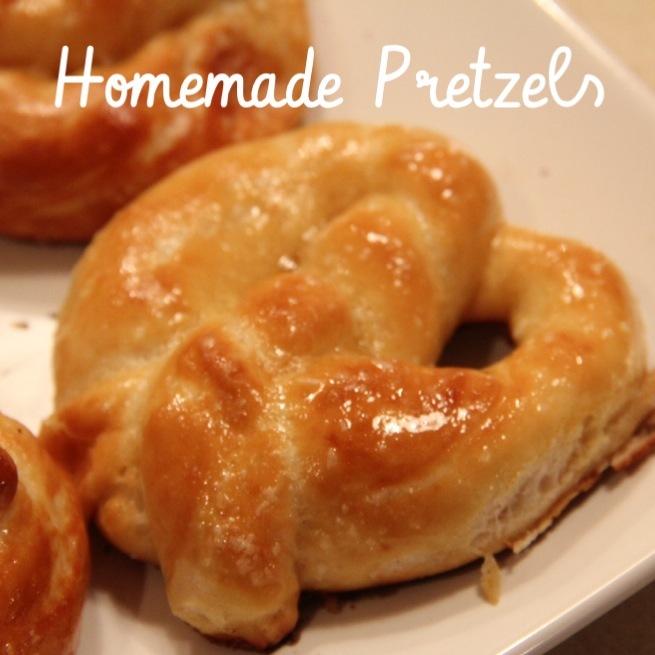 Twist into a pretzel shape and dip it in the baking soda/water mixture. 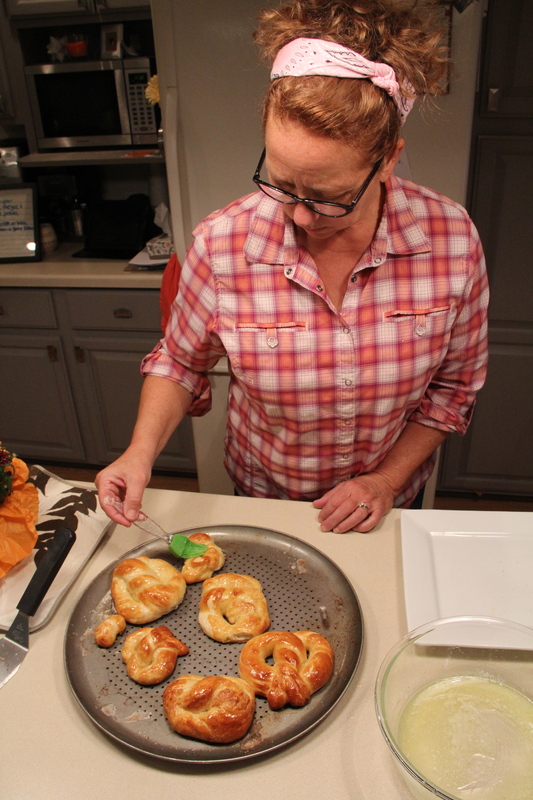 This sounds strange, but that’s the key to making pretzels I learned. 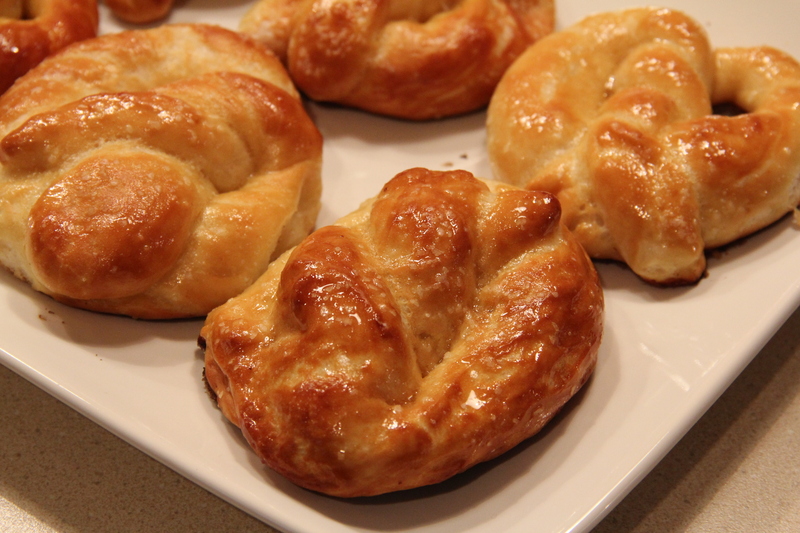 Place pretzels on a greased baking sheet, sprinkle with coarse salt and bake for 7-10 minutes. Last but not least, once they are nice and brown- take out of the oven and brush the melted butter over the top of each pretzel. (If you were wanting to make sweet pretzels, at this point you can dip them in a mix of sugar and cinnamon). We chose to serve ours with a cheese sauce and a cream cheese dip. Cheese recipe below. On the stove, melt the butter and add in garlic & flour. Whisk until lightly browned. Next add in the milk and spices and whisk until blended and it starts to thicken. Add the cheese and continue to whisk until it’s thoroughly melted and thickened to your desired consistency. I ended up adding more cheese to mine when I made it the second time. Our fearless crew in the kitchen. 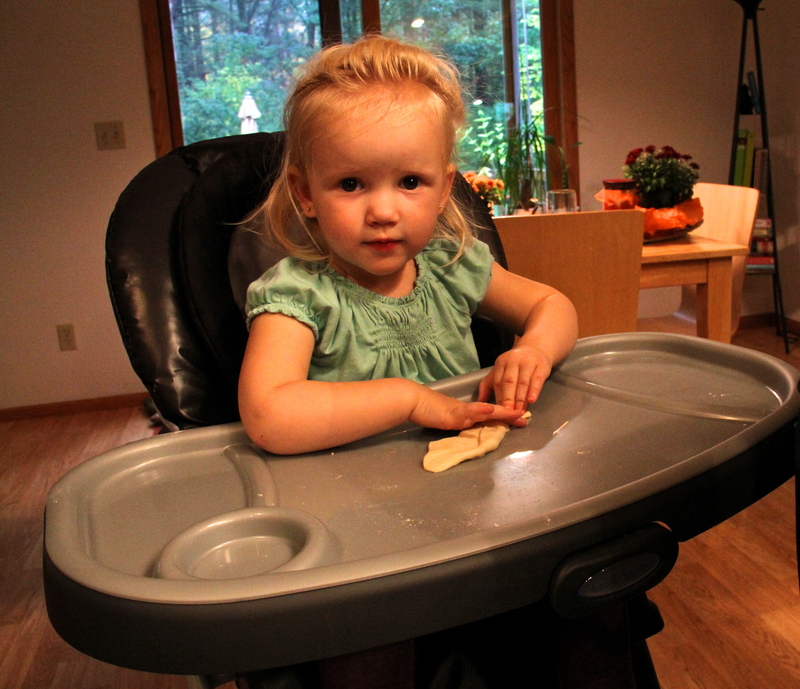 From left to right: Ila (in the highchair) Mal, Emma, Heston and Hardy. Mom was taking the picture. 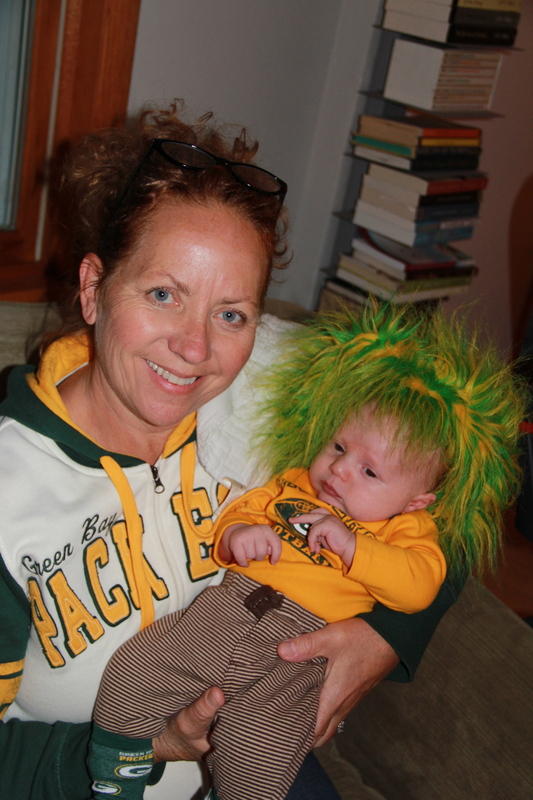 Also Houghton was too little to help with this but he did great helping cheer on the Packers with us this weekend. I couldn’t leave him out of the blog so here’s a quick pic of Mom and Houghton from the weekend. 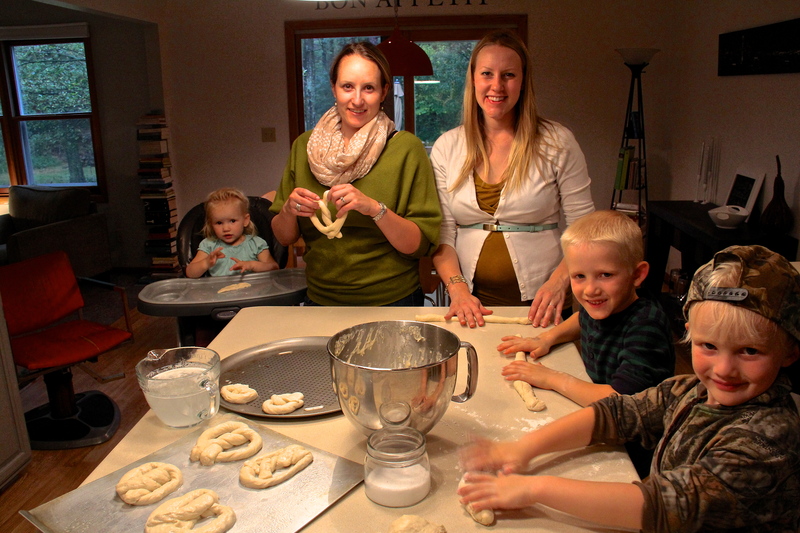 Now back to more action shots of the pretzel making. Seriously so cute! 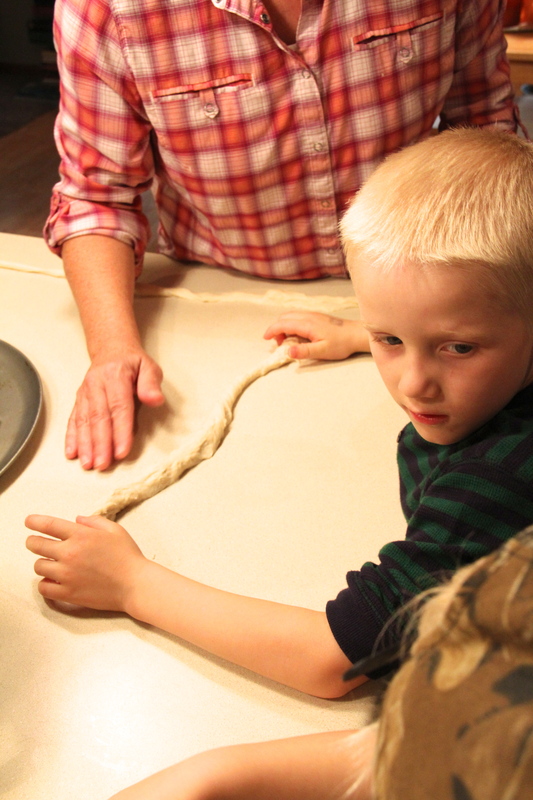 They did a great job rolling and shaping their pretzels. Dipping the pretzels in the baking soda/water bath. Mom brushing them with butter once they were done baking. Food, family and fun! Hope you enjoy these as much as we did. priceless what more can I say …..love you all fun times we have making memories vundabar………..